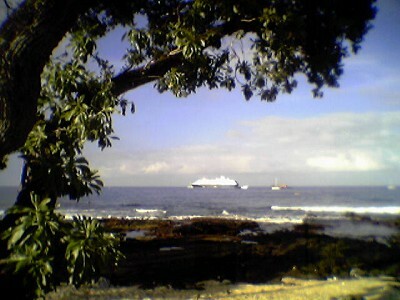 That’s the cruiseship Amsterdam in Kailua Bay as seen from Hale Halawai in town. Yesterday was hot and humid, even more than usual due to Kona winds. That’s when the winds reverse and instead of the tradewinds coming from the north-east the wind comes from the south-south-west. This made Kailua-Kona on the windward side of the island. Hot, humid, cloudy and we had thunder yesterday. Today Kona was fairly clear, still a bit muggy but it looks like the tradewinds are coming back. Weather should be pretty good for the rest of the week. Due to the recent rainy weather we are now dealing with mosquitoes. I don’t care what people claim about citronella candles, electronic gizmos and anti-mosquito plants, the only thing I’ve found to repel those bloodsuckers are either: Spray-on repellent with deet like OFF! or King Mosquito coils. People in Hawaii are familiar with the slightly sweet & thick smelling mosquito coils. This is the only thing that works if you want to be outside and don’t want to spray insecticide on yourself. I’m sure there are $500 methane powered mosquito killers but you gotta be pretty serious to buy one of those. My car will get a rebuilt engine and will be in the shop for a couple of weeks. Better for me to know what’s going on instead of being stressed in limbo. Once I get my car back “Adventure Fridays” will probably continue.